Controlling the improper humidity level in an enclosed area, a building or room can cause detrimental health concerns, damage highly-priced possessions and also lead to a change in storage conditions. It is important to measure relative humidity whether it is to ensure appropriate cigar storage or maintaining proper conditions for maintaining your respective animals, or at a greenhouse or maybe just at home. The most excellent manner of measuring the relative humidity in a specific area is using a hygrometer (digital). Well, in our article, reviews about the best-selling hygrometers that are available in the market are shared by us. The article also includes the top-most humidor model, which is for use at home as well as is overall the most accurate. Occasionally, the hygrometer may also be called as the humidity gauge or maybe humidity meter. Basically, it is the device to measure the humidity in the environment. Particularly, the hygrometers measure humidity or rather the moisture content within a specific environment, mostly by considering changes in pressure and temperature. A lot of brands of hygrometers are available in the market, comprising of hygrometers of digital or electrical or mechanical type, dew point type, and psychrometers. In order to obtain humidity readings that are instant and accurate, in various industries, greenhouses and any outdoor areas most often the use of digital hygrometers is in trend. Apart from industrial or commercial purposes, there are a lot of indoor uses as well as personal uses of the humidity meters. For example, maintaining storage conditions of food in spaces to keep it moisture-free, controlling wine cellar conditions or preserving of cigars. Mentioned in this article is the list stating our top list of hygrometers that are available in the market, their individual ratings and the reviews. Along with observing reviews from customers, we have completed our research as well as testing. This has enabled us to provide you with our suggestions on excellent versions for each use. Ideal Sciences is the company that manufactures our best pick which is the remote ‘Temp Stick hygrometer’. Both humidity and temperature conditions are monitored by its sensor. 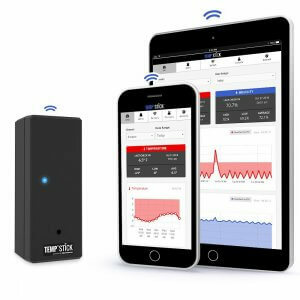 It is able to connect to any network of WiFi in order to receive text alerts or email once the humidity or temperature cross the limits that have been pre-set. The Temp stick is manufactured in the United States of America. It is thoroughly precise as well as has a versatile alternative to constantly monitor parameters within any environment and from literally any location. This device is very easy to install, simply takes minutes, unlike a few other wireless hygrometers. Its calibration is carried out by the factory itself (which can be adjusted by you, if necessary). Its power source is derived from 2 batteries of AA type. According to its usage, users report the lifespan of the battery ranging from 6 to 12 months. In case the battery power is low, you’ll receive an auto alert. This reduces the downtime. We evaluated that Temp Stick is highly accurate as well as reliable. It is a wireless hygrometer that is designed for functioning in temperatures ranging between -40 degrees Fahrenheit and 125 degrees Fahrenheit (with an accuracy of ±0.4 degrees Celsius). It is able to monitor relative humidity ranging between 0% and 100% (with an accuracy of ±4 percent RH). This device also has an app by which you can view your whole history of individual readings, this is something we loved. Controlling parameters is simple with the help of the intuitive app that is available in devices like the Android and iPhone. Also, there is a version that is web-based for monitoring of parameters using your respective computer. · Connect with a limitless amount of sensors that can monitor several locations using a single account. · Select the frequency for the device to measure the parameters, like at intervals of 60, 30, 15, 10 or 5 minutes. · Customize alert triggers (for example, the alert trigger sets off once humidity rises to a specific reading). · Add a maximum of 10 contacts as recipients to obtain alerts. Even though this device is a costlier alternative as compared to the other options within this article, its value in the long-term is great. This device doesn’t have any type of hidden fees or subscriptions, something that you’ll commonly observe with the other devices. Additionally, its inbuilt WiFi network connectivity, the intuitive app as well as its accuracy makes it highly reliable. We clearly consider that this device, Temp Stick is an investment that is worthwhile. In case our first option, Temp Stick doesn’t fit into your budget range, then you can try our next ultimate option of a hygrometer, which is ‘SensorPush’. It is the best for monitoring of home humidity conditions. In perfect situations without any obstructions, its sensor picks up a range of 325 feet using the Bluetooth. Also, we have the option of purchasing the device of the WiFi gateway in order to receive alerts from any location, just like our previous option, Temp Stick. However, the gateway is bulky and also an expensive accessory compared to the device which is small and a compact unit. This device is able to store a maximum data duration of 20 days within itself and it records readings constantly (each minute). Even if you are at a distance from home, maybe for one hour or a week, you can track the humidity. The device – SensorPush will keep monitoring as well as storing data which can be retrieved as you reconnect. 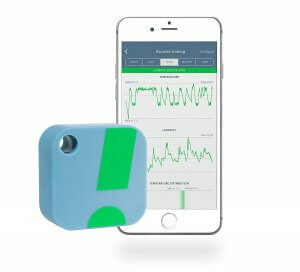 Similar to Temp Stick, indefinite data can be stored within the user-friendly app of SensorPush (it is available in devices like Android and iPhone). SensorPush is versatile as well as flexible and has the potential of monitoring sensors (an extensive number of sensors). Each of these sensors can be controlled by several users (or an unlimited amount of users). All online user reviews give us the feedback that the devices’ setup is simple. Its sensor is powered by a cell battery of the CR2477 cointype (it is included). The lifespan of the battery is more than 1 year. Additionally, the SensorPush’s sensing component which is Swiss-made provides measurements that are accurate and reliable. Upon our study, we confirm that SensorPush is a superior-quality type of hygrometer which is very user-friendly. Also, it is cheaper in cost than our previous option, Temp Stick. But, in case you need distance monitoring of conditions when you are located away from home, then you will have to include an additional device of WiFi gateway. This additional device brings up the price significantly. In order to monitor temperature and humidity conditions from any location, we prefer our previous option of Temp Stick. However, SensorPush is definitely the best option for monitoring of parameters within the house. The typical use of hygrometers is inside the humidor, used to store cigars within controlled conditions. Upon studying and evaluating many options, the ‘Caliber 4R’ is what we prefer. It is manufactured by Western Humidor for use in humidors for storing cigars. Caliber 4R definitely is an advanced yet affordable humidity sensor. It is close to any high-end hygrometer used in laboratories with respect to its accuracy. This device measures a range between 20% and 90% with ±1 percent RH. The device, although small has a classic analog and elegant design. This makes this device the exact solution for the humidor. The device is calibrated by the factory itself, however, the calibration can be adjusted later, if required,as well. A lot of users prefer the devices’ simple analog and color-coded sensor design. These features paired along with an accuracy of the great digital display is the main reason for the user’s choice. The device monitors real-time humidity and temperature, as well as a 3-day low/high and it also averages the temperature and humidity. The device’s humidity meter is fixed with the help of a metal disk that sticks to the humidor as well as the magnetic disk which is behind the gauge (humidity). Considering the affordability and accuracy, we believe that this device is the best option for a hygrometer to ensure an appropriate environment for the storage of cigars. Even though features like alert options or remote reporting are unavailable, this device is functional and highly accurate obtained at a low cost. Very few users have reported issues with respect to calibration, however, most of the users raved about its reliability and accuracy. Another sole negative point that we noted amidst many user reports was difficulty in screen adjustment (screen not adjustable) as well as difficulty in reading if not viewed from the perfect angle (right angle). In case you’re inspired to monitor conditions from several areas within your respective home, inclusive of outdoors as well as indoors, we suggest the device– ‘Ambient Weather WS-10-X4 Wireless Thermo-Hygrometer’. The Thermo-hygrometer comprises of a central console (indoor), with 4 remote sensors having the capacity to link up with a total of 8 sensors. The readings of humidity and temperature display from the console as well as every sensor. There is a separate sensor to the console as well. Nevertheless, the device makes use of the wireless signal that has a limited range of transmission (under most situations – about 100 feet). All the sensors should be within this signal range. This device will provide audible and visual alarms from the primary console in case the humidity or temperature exceeds the pre-set minimum or maximum levels. This offers convenient, passive and simultaneous monitoring of the conditions within your house. For example, you simply can keep the sensors placed in the storage room, humidor, outside, attic, basement, any area of the house or wine cellar, so you can monitor these areas simultaneously. The only major drawback of this hygrometer (home hygrometer) is that there is no companion app in order to remotely monitor the conditions or store the data. Nevertheless, in case you’re interested in finding the best hygrometer for home-use in order to monitor several areas throughout your home as well as receive alerts upon a considerable change, then this is the best option for you. The device called ‘Caliber IV’ is manufactured by the Western Humidor. It is quite similar to our previous one that is ‘Caliber 4R’. However, the major difference is its display type: Caliber IV shows a digital display and Caliber 4R has an analog as well as a digital display for a better classy design. The functionality, as well as specifications, are very similar to ‘Caliber 4R’ having an accuracy of measurement of ±1 percent RH as well as the capacity to re-calibrate its sensor. High accuracy is the quality that is apt for both the hygrometers, this makes them perfect to be used inside the humidor. We have seen few comments from users regarding the concern on the calibration of the device. Although the factory calibrates the device, we usually recommend the calibration of the new device upon receipt in order to ensure the readings are accurate. This device‘Caliber IV’by size is slim and small. It has a safe magnetic mount. This makes it simple to fit within the humidor. Both humidity, as well as temperature, is measured by this device. It also records 3-day measurements that are average, low and high. Similar to ‘Caliber 4R’, the only negative point is that there is no remote monitoring feature provided by the device. Nevertheless, its affordable cost along with a high level of accuracy definitely shapes it into the ultimate digital type of hygrometers for our humidors. In case you require measurement of humidity is an area that is difficult to reach then, ‘Extech 445815 humidity meter’ is the best option. It comes along with an optional probe for remote monitoring. ‘Extech 445815’ provides a huge display which shows us the level of the current dew point, humidity, and temperature within the area or room. Similar to the ‘Ambient Weather WS-10’ device, it is possible to set maximum and minimum numbers of humidity. So, once humidity levels exceed these numbers you will receive visual and audible alerts. The remote probe is the best unique feature that is contained in the sensor. It has a cable of the 18-inch size used for measuring within ducts, behind walls, or in areas which are not easily accessible. Also, it comprises of a stand to operate over any desk or a surface that is flat, additionally it contains a wall mounting bracket. ​The device ‘Extech’ is certified by NIST and it satisfies the ISO as well as requirements of regulatory bodies for traceability and accuracy of product to the reference standards that are nationally recognized. This humidity meter has no capability for remote monitoring. While the data storage is only the recall of readings that are maximum and minimum. However, considering it has only basic functionality, one might find it a little expensive. But, this device is the perfect alternative for various professional applications particularly in case you need NIST certification for your measurement or when you require to measure in areas that are difficult to reach, in ducts, behind walls, etc. This device is your best option if you’re interested in a simple, basic monitor for humidity with the best accuracy within a very affordable cost. ‘AcuRite 01083’ is highly accurate up to ±0.5 degrees Fahrenheit as well as ±2 percent RH. It has a huge display that shows temperature and humidity, accompanied with levels that were low and high over the past 24 hours. Also, the device includes an indicator which is a color-coded level of humidity, this displays if levels of humidity are okay, too high or too low. Ideal levels of humidity do vary based upon the use, location, or person, however, the indicator comes in handy just for reference only. This device can easily stand or can be quickly mounted at any location within your house. It simply sits straight on a tabletop or desk, it is easily wall-mountable, and also includes a backing that is magnetic. In order to obtain the most accurate readings of humidity and temperature, this type of sensor is not required to be calibrated manually. Nevertheless, it is accompanied by instructions for the calibration (step-by-step), so the process is made easy. 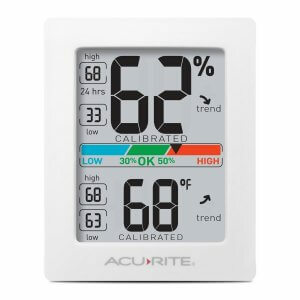 In case you only require the measurement of humidity in a single place that is indoors, with no need of remote monitoring, then this one is the ultimate indoor option for hygrometer and at a great price. Which is the Ultimate Digital Hygrometer to be used for the Humidors? Perfect environment for any cigar humidor include maintaining a temperature of 70 degrees Fahrenheit and 70 percent RH (Relative humidity). For the monitoring of temperature and humidity within your humidor, you can use the hygrometer. The cigars if not properly stored under correct conditions tend to lose their aroma and flavor, mold or dry up. This is the reason the cigars ought to be stored within the humidor at controlled conditions. In order to achieve the best quality and flavor, the cigars need to be stored in conditions wherein the level of relative humidity ranges from 68% to 72% and the temperature is 70°F. We strongly recommend the use of Boveda 72 percent Packs for Control of Humidity in order to keep up ideal conditions within the humidor. A lot of humidors are accompanied by a hygrometer. However, we have noted that often there are much better alternatives if bought separately. The device ‘Temp Stick’ is the most preferred hygrometer for use in a humidor since you are able to view the humidity and temperature from simply any location. The credit goes to its inbuilt WiFi connectivity as well as and the user-friendly app of the smartphone. We all love this device since you can receive all the alerts without opening your humidor in cases when the humidity or temperature exceeds the trigger levels, these levels can be pre-set via its app. The devices ‘Caliber 4R’ or ‘Caliber IV’ are both more affordable. These two are highly accurate hygrometers. They have been designed particularly to be used within a humidor. However, they don’t possess the functionality of remote monitoring which‘Temp Stick’has. Which is the Hygrometer that is Most Accurate? Among all the monitors of humidity that we have analyzed, the Caliber IV and Caliber 4R are both that are highly accurate devices. Both read within an accuracy of ±1 percentage RH and measure a range of relative humidity between 20% and 90%. This means both devices Caliber IV and Caliber 4R have accuracy within 1 percent of the measured humidity, this overcomes all options that we have reviewed. Our most preferred hygrometer, Temp Stick, has an accuracy of ±4 percent RH (this still is considered as the best accurate amidst other remote hygrometers). Both devices of the Caliber are calibrated by the factory. However, these can be re-calibrated as well by ±6 percent. The accuracy of ±1 percent RH of the 2 sensors seems very impressive, particularly for a cheap, hygrometer for home-use. Usually, this type of accuracy is expected from a humidity meter used in a laboratory, which could probably cost 1000 dollars. We would highly suggest either the Caliber IV or Caliber 4R if accuracy is your primary requirement. In case you need to maintain healthy levels of relative humidity within your house, for proper conditions or to keep priceless artwork well-maintained, investing in a hygrometer is important. Also, monitoring your humidors for cigars require proper tracking of humidity within the environment. 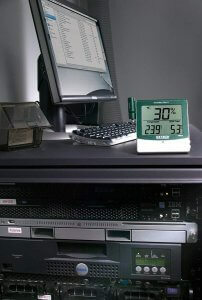 The digital hygrometer offers you accurate readings, this lets you know when conditions require adjustment. Nowadays in the market there a lot of humidity meters available which have a broad collection of accuracy, features as well as prices. Although, there are few hygrometers which are simple and very basic in nature, their measurement of humidity is within a single given area. While others might include multiple sensors which monitor the environmental conditions from various regions and few allow remote monitoring via an app of the smartphone. According to our thorough and detailed research, we found the ultimate hygrometers among the rest are: Temp Stick, the Caliber 4R and the SensorPush. Specifically, for use in most applications we highly suggest, Temp Stick specifically if you require the feature of remote monitoring in your device. 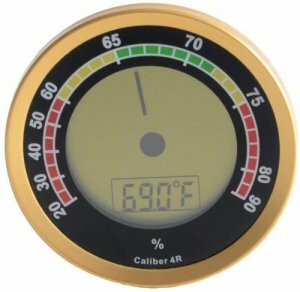 If you require a more affordable, accurate device for your cigar humidor, we recommend Caliber 4R hygrometer. However, you need to keep in mind the humidity gauge’s calibration by using the calibration kit upon receipt and you need to re-calibrate it at intervals periodically in order to keep up its measurement accuracy.